In January this year, I once again had the pleasure to co-host a positive psychology session on Gratitude in business together with Armin Schubert. After all this, OOP ‘software meets business’ conference was the first time where Armin and me could deliver our passion-topic at a bigger tech conference. How awesome! 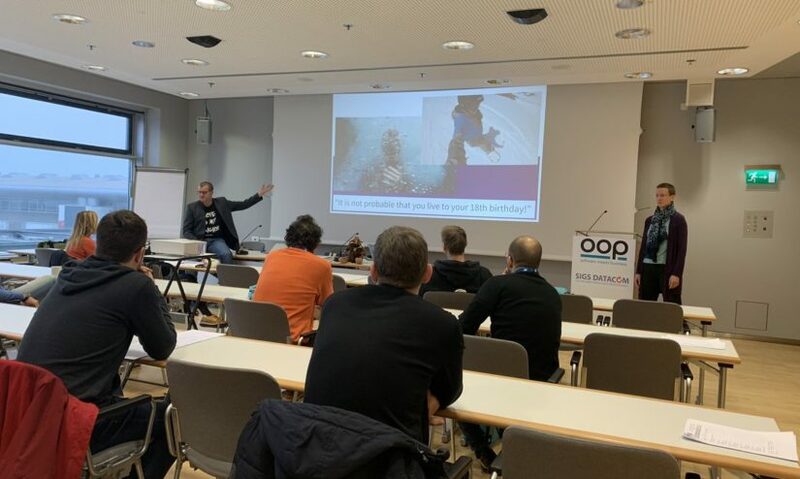 Although Armin had to cope with a really bad cold at OOP 2019, we both were honored with exactly the right people attending our early 9am session on Wednesday. We were also honored to inspire people, to reach hearts and to spark great things afterwards…. And we were honored that the artists from Remarker graphically recorded our session. I am still deeply grateful for their artwork. … a lot happened since Armin’s initiating session at Agile Coach Camp Germany in June 2018. Since then, our interactive workshop evolved a lot. And it’ll for sure develop and evolve further as we both learn more every day. We learn from the participants in every single session and we get inspired by all the stories other people share with us. We’ll happily reach out to you!